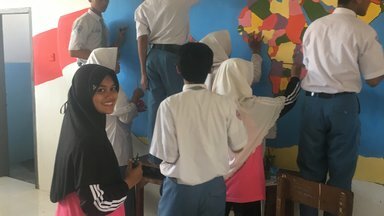 Contributions to the Indonesia Country Fund support sustainable, community-driven Peace Corps Partnership Program projects in Indonesia that are led by Peace Corps Volunteers. These projects focus on English education and other pressing needs determined by the community. Projects include, but are not limited to, English camps, English competitions, youth and leadership programs, library projects, sports facility renovation, world map projects, and animal sanctuary support. Students working together to paint a world map mural in their classroom. 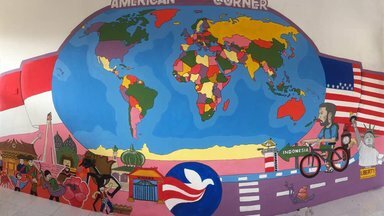 The finished product; a colorful world map mural!